Brian displays his artworks each year in the Evergreen Fine Arts festival at Heritage Park in Evergreen. Meet the artist and see his works in person this August at the show! Brian's early accomplishments included works in graphic design and illustrations, but he was unsatisfied with the constraints of these careers. In 1980 he left commercial art to dedicate his energies to fine art, instead. In the mid 80's Brian encountered Taos, Santa Fe, and the great desert southwest. The clean, dry air, and clear light of the southwest were a major influence on Brian's understanding of light in his works. Today, this influence is evident as warm colorful glows, reflected light, and deep shadows that dominate his paintings. 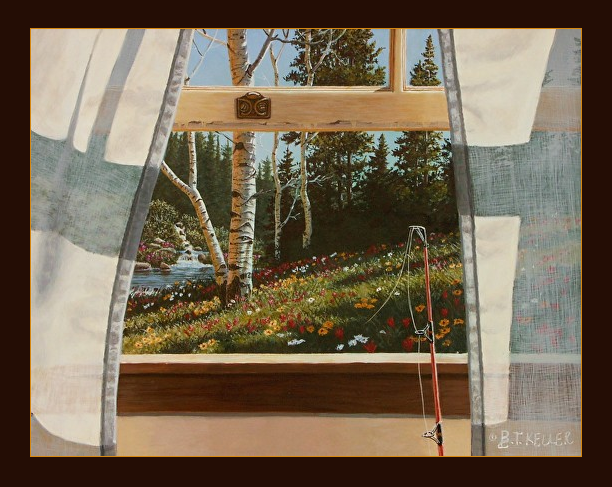 In 1991 Brian began work in egg tempera. Tempera paint is a light, delicate paint that dries almost immediately and does not blend or smear. Since his primary goals are to create illusions that capture light and a sense of place which invite the viewer into his paintings, this precise paint is ideally suited to his work. The clarity of this paint allows him to capture the fine detail and bright highlights that complete these illusions. All artworks shown are the copywrited works of Brian T. Keller and may not be reproduced without the artist's permission. My work is currently part of a continuing gallery showing called 'Scapes, held this March at Studio 12 Gallery, located at 209 Kalamath, a member of the Santa Fe Gallery District. The showing will be conclude April 12th. 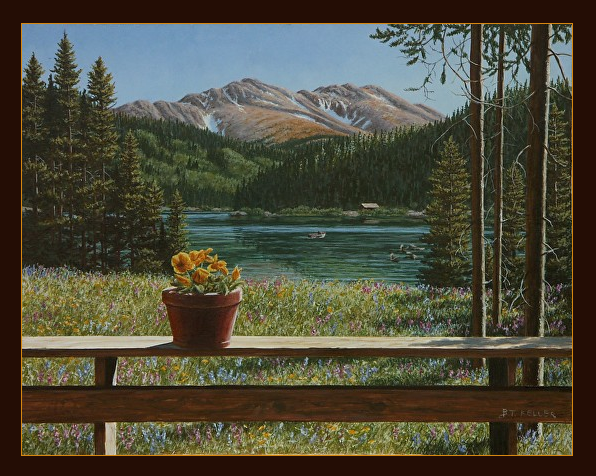 'Scapes is an exhibit of artworks from several Colorado artists and features both two and three dimentional pieces. Though the central theme is landscapes, the exhibit includes a wide variety of media and styles ranging from contemporary and abstract pieces to the finely detailed paintings for which I am so well known. I will be showing some new pieces for the first time, including some from my new nocturnal series. I will once again be putting on an egg tempera demonstration for those who would like to see the egg tempera process. It will begin about 6:00 pm. It will be a fun and informative evening. I hope you can make it! I will be showing my work this coming weekend (May 31, June 1 & 2) at the Prairie Village Art Festival. As I was unable to exhibit at the Brookside Art Annual last month, this is my one opportunity this year to show my work in Kansas City, so I hope you can attend. I have several new pieces to show, including "Dog Days" above, with both prints and the original available. I also have a new series of nocturnal paintings which are truly unique. I hope you can stop by and see them! The next showing of my work in the Denver area will be at the Performing Arts Complex, on Friday, Saturday and Sunday, May 22 - 24. Featured will be several new pieces, including two that are also in print form. "Trailside" is a new Colorado landscape which outdoor enthusiasts will love, and "The Bookmark" is a fine addition to my beach series. Also included will be the first-time showing of some new paintings created exclusively as originals with no prints available. I hope you can stop by and chat, and see what new pieces I have come up with, this year. Whether you are considering another purchase or not, I would be pleased to meet with you and show you my newest work.